A designated National Historic Landmark, the Juliette Gordon Low Birthplace in Savannah, Georgia hosts 65,000 visitors each year from all 50 states and from countries around the world. Owned and operated by Girl Scouts of the USA as a National Girl Scout Program Center and a historic house museum, the Birthplace is as a primary destination for Girl Scouts and for the general public. Guided tours and special programs are available throughout the year. The Mighty Eighth Air Force Museum preserves for all Americans the stories of courage, character and patriotism displayed by the men and women of the Eighth Air Force from World War II to the present. Crosswinds Golf Club is the area's most unique golfing venue offering 27 holes of some of Savannah's best golf. We are known for our excellent greens and course conditions throughout the year. The Hilton Garden Inn Savannah Airport hotel of Georgia is conveniently located to both I-95 and Savannah Hilton Head International Airport. Our tranquil lakeside setting makes us an appealing location for both the corporate and leisure traveler. The Hilton Garden Inn Savannah Airport hotel of Georgia provides many of the amenities that you enjoy at a full service property, without the full service prices. Each of our beautiful Hilton Garden Inn Savannah Airport hotel rooms is equipped with a microwave, refrigerator, coffeemaker, hair dryer, iron and ironing board, large working desk and complimentary high-speed internet access. Some of the amenities that our Hilton Garden Inn Savannah Airport hotel guests enjoy are our complimentary airport shuttle (5am-12midnight, daily), the Great American Grill (serving breakfast, lunch and dinner), Pavilion Pantry, outdoor pool and spa, fitness center and the 24-hour business center. 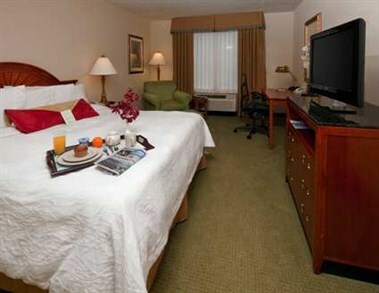 Whether you are traveling to Savannah, Georgia on business or pleasure, Hilton Garden Inn Savannah Airport hotel of Georgia has everything you need, right where you need it. We look forward to being your hotel of choice when visiting Savannah, Georgia. 0-14 days 100% 15-21 days 50% 22-30 days 30% Although this cancelation policy is located in the catering contracts, we typically just charge a cancelation fee depending on how far in andvance the event is canceled. We have three beautiful meeting rooms that are available on a first come, first serve basis. Please contact Brittany Beyer, Director of Sales, for details on meeting space.